The first move any self-respecting millennial will do when they get a new smartphone is to turn off the phone ringer. Much to the chagrin of parents everywhere, calling a millennial will only result in a voicemail, while texting one gets almost immediate response. Depending on age and stage, while some parents still may not have quite figured out texting is 100x more effective than calling, most bankers we know are not in that group and have figured this out. We bring this up because the millennial generation is quickly becoming the star of bank and other company marketing tactics, as they seek to grow. This demographic cohort is growing fast and taking over the workplace. Millennials are surpassing the Baby boomers and now are more than 75mm strong. That means the millennium generation has now ousted Boomers as the largest living generation in the US, so banks are adjusting to these potential customers. Bankers know that by 2020 it is estimated that millennials will be 50% of the overall workplace so change is inevitable and should be embraced. One way to do so, that many banks have found out, is text messaging. Millennials despise the historically primary purpose of the phone--namely making and receiving calls. These customers don't like to talk on the phone and they prefer to not answer long emails either. They simply want a short text message. Consider just some of the statistics around the value of text messaging. For instance, research by Pew finds texting is the most widely and frequently used smartphone app with over 97% of people using it daily. Pew also finds over 80% of adults' text, making it the most common cell phone activity. 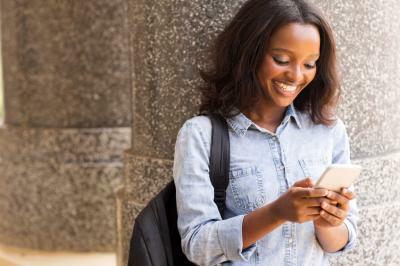 For banks, texting is also a great way to get in touch with customers. Here, research by Velocify finds text messaging has a 45% response rate while email is only 6%. Meanwhile, research by Connect Mogul finds 90% of all text messages are read in under 3 minutes. Finally, consider research by CTIA that finds it takes the average person 90 minutes to respond to email, but only 90 seconds to respond to a text message. Clearly, if you want to reach a customer quickly and get a response, it pays to have their cell number. Getting back specifically to millennials, we find still other research by Business Insider finds the average millennial exchanges 67 text messages per day. That is a lot of activity, so you can bet eyeballs are constantly glued to those small screens throughout the day. The data shows that millennials as a group appreciate it more when you get right to the point so they embrace texting over phone calls by a wide margin. Finally, we take a deeper dive into the business side of things to see if the data holds up. Here eWeek research finds over 80% of people use texting for business and 33% of business professionals say they cannot go 10 minutes without responding to a text message. As if that weren't enough, research by TextRequest finds 79% of bosses also support texting for business purposes. In closing, consider a final bit of research by TextRequest and by Gallup. The first one finds Americans check their phones 150x per day, while Gallup finds sending and receiving text messages is the most prevalent form of communication for American adults under the age of 50. Whether your customer is a millennial or not, clearly the data shows texting is prolific. As such, it should probably be a significant part of your sales and marketing strategy over this planning period too. Yields fell 2bp amid growing concerns about stress on European banks impacting a 2016 Fed rate hike. A KPMG survey of 100 executives at banks with assets between $1B and $20B finds respondents said the following were among the most important drivers of alliances, mergers and acquisitions: access to new technology and products (59%), access to new resources (56%), access to new geographic markets (50%), product synergies (33%), employee payroll expense (33%), and regulatory changes or reform (33%). Research by RR Donnelley on M&A transactions finds 80% say the success of integration to some extent or a large extent depends on the due diligence and integration teams working together. Meanwhile, 70% say it is important for the integration team to contain some of the same members as the due diligence team. A survey by the RMA of community banks finds the primary aspects of enterprise risk management respondents said regulators want them to implement in the next 12 months are cybersecurity (88%), stress testing (78%), risk governance (75%), risk measurement and evaluation (74%), and data and infrastructure (64%). Moneyrates.com reports 61% of the largest 100 banks do not charge any monthly fees for online banking. Research by Deloitte and MIT on digital disruption finds specific technologies ranked as most important to organizations this year are: analytics (29%), mobile (14%), cloud (14%), social (11%), internet of things (8%) and security (8%). Research by Bromium Labs finds as many as 27% of news and entertainment websites deliver malware through malicious advertisements. These infected advertisements install malware when the reader clicks on the advertisement in question.